The next meeting of the ICD-9-CM Coordination and Maintenance Committee, which is jointly chaired by CMS and CDC, takes place on September 19, 2012. There is a very full agenda for this meeting. The meeting materials Proposals document has now been published. Note: I have no connection with the Coalition 4 ME/CFS or with the development of any proposals submitted by this organization. All enquiries about the proposal submitted to CMS/CDC on behalf of the Coalition 4 ME/CFS should be addressed directly to the Coalition 4 ME/CFS. Note also that the proposal from the Coalition 4 ME/CFS and the alternative proposal from CMS/CDC are set out in accordance with the requirements of the ICD-9-CM C & M Committee for the submission of proposals. At the ICD-9-CM Coordination and Maintenance Committee’s September 14, 2011 meeting, a presentation had been made on behalf of the Coalition 4 ME/CFS in relation to the formal submission of a proposal. 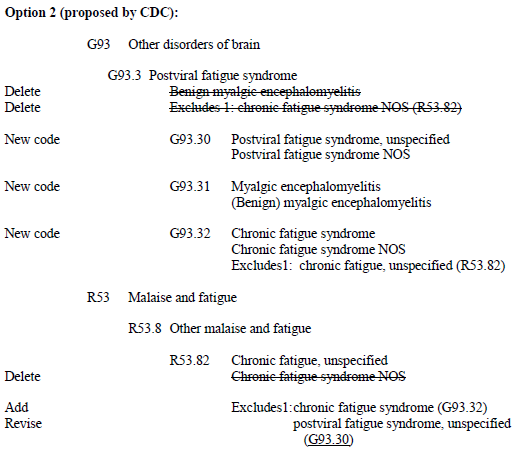 The proposal requested that consideration be given to moving the classification of Chronic fatigue syndrome from its current proposed location within the ICD-10-CM R code chapter (Chapter 18: Symptoms and signs) to the G code chapter (Chapter 6: Diseases of the nervous system). This would bring the chapter location of Chronic fatigue syndrome in ICD-10-CM in line with the international version of ICD-10, the Canadian ICD-10-CA and proposals for the forthcoming ICD-11. No NCHS decision reached in response to the September 2011 proposals and the public comments received in respect of these proposals was conveyed following closure of the public comment period, last November. However, further discussion of Chronic fatigue syndrome and two additional proposals are tabled on the agenda for discussion at the September 19, meeting, tomorrow. I am appending the relevant extract from the Diagnosis Agenda and Proposals document which was published on the CDC website overnight. An official audio and a Summary of the meeting should be available in due course on the CDC website. I will update with these when available. 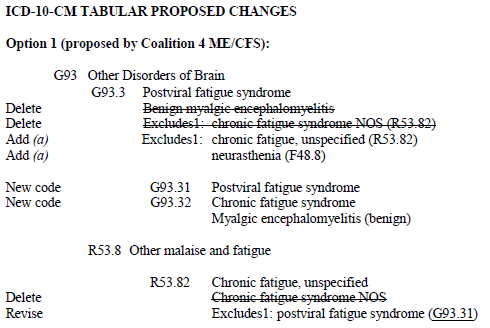 A proposal, submitted by the Coalition 4 ME/CFS, to modify codes for chronic fatigue syndrome (CFS) was presented and discussed at the September 2011 ICD Coordination and Maintenance Committee meeting. The National Center for Health Statistics also presented an alternative proposal, Option 2. There were many comments from the audience, and there was general support for the NCHS-proposed Option 2, moving CFS from Chapter 18, Symptoms, signs and abnormal clinical findings, not elsewhere classified, to Chapter 6, Diseases of the Nervous System but retaining separate codes for CFS and myalgic encephalomyelitis (ME). The rationale for retaining separate codes included agreement on the importance of being able to extract data on the two conditions separately or combine, as needed. It was also noted that term ME is not seen in medical record documentation. Written comments received on this issue were inconclusive. There was not agreement that the two conditions are the same. While some comments were from private citizens, others were from advocacy organizations and associations that represent health care providers and other large constituencies that use the classification. The public comment period following the meeting is not meant as a poll or survey. Analysis of public comment focused on the substance of the comments; whether there was a clear scientific consensus regarding the etiology and manifestations of the condition; and an understanding of the classification, its structure and conventions, and its uses by the health care industry. As noted in the information from the September 2011 presentation, the cause or causes of CFS remain unknown, despite a vigorous search. While a single cause for CFS may yet be identified, another possibility is that CFS represents a spectrum of illnesses resulting from multiple possible pathways. Conditions that have been proposed to trigger the development of CFS include infections, trauma, immune dysfunction, stress, and exposure to toxins. Research in this area is ongoing. There are several case definitions currently in use, some separating CFS from ME, and others merging the two conditions. The most widely used are the 1994 case definition (http://www.cdc.gov/cfs/case-definition/index.html ), the Canadian and the Oxford definitions. A new case definition for ME was published in the 2011 international consensus criteria that emphasized recent research and clinical experience that strongly point to widespread inflammation and multisystem symptoms and neuropathology. This new definition, which considers ME and CFS as synonymous terms, however, has not been widely vetted by the health care community at large. While there is no consensus on one case definition, there is consensus that this is a serious and complex syndrome, and it is likely that there are multiple subgroups. 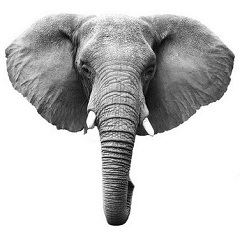 It has been noted that some providers use the terms interchangeably while others consider one condition a subgroup of the other. There is also some overlap with fibromyalgia and CFS/ME could be considered one of the multiple chronic overlapping pain conditions. 2. Holmes et al. Ann Intern Med (1988) 108:387-389. 5. Carruthers et al.. J Intern Med (2011) 270: 327-38. The Coalition 4 ME/CFS has stated that they do not support Option 2 proposed in September 2011 and have submitted a revised proposal. A revised Option 2 is also being proposed, consistent with comments received supporting Option 2 as noted above. The Coalition is also requesting that their proposal be considered for implementation prior to October 1, 2014 even though the condition is not a new disease and therefore does not meet the criteria for implementation during the partial freeze. 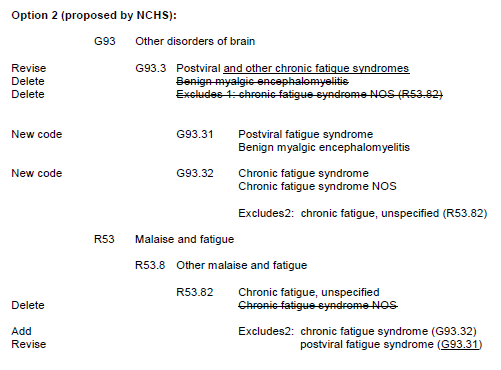 CDC suggests retaining the Title term G93.3 Postviral fatigue syndrome (CDC Option 2, September 2012). with a discrete Child category G93.31 Myalgic encephalomyelitis, Benign myalgic encephalomyelitis. G93.32 Chronic fatigue syndrome, Chronic fatigue syndrome NOS. 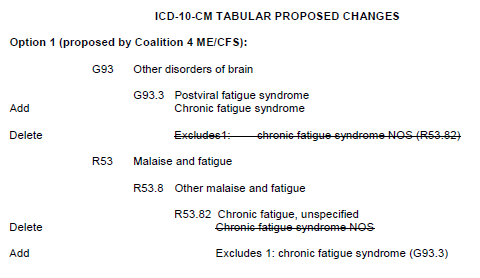 On July 15, the Coalition 4 ME/CFS submitted a written proposal to the ICD-9-CM Coordination and Maintenance Committee to restore CFS to Chapter 6 “Diseases of the Nervous System” code G93.3 in the ICD-10 Clinical Modification (ICD-10-CM) in the US. This action follows the September 2004, August 2005 and May 2011 recommendations of the federally-appointed Chronic Fatigue Syndrome Advisory Committee (CFSAC). In each case, the committee recommended that CFS be in the neurological classification in the ICD-10-CM, in line with the rest of the world. On September 14, the Coalition 4 ME/CFS made an oral presentation to the committee and responded to concerns expressed by audience members. We are asking medical professionals to comment on this important issue before the comment period ends on November 18.